Rosemary, like her sister Serenity, is a LARGE and substantial doe. She easily achieved her MILK STAR in 2007 as well as was recognized for type and production with the SUPERIOR GENETICS designation. Her final appraisal was in 2009 with a 90 (EVEE). We've retain her daughter from 2007 (Oprah) and daughters from 2008 (Thelma and Louise). Thelma is a permanent CHAMPION. 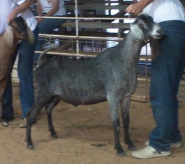 Louise (a Lightning daughter) her junior leg with GRAND CHAMPION (43 juniors), and BEST JUNIOR DOE IN SHOW wins at the 2010 Fort Worth Stock Show. 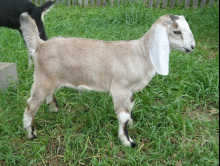 We also retained a 2010 doe (Nutmeg) & 2011 doeling Chamomile (Cammie). We've repeated an AI with P-O-F Royal Marcus in hopes of getting another buck as wonderful as GCH Latte Da Royal Image...and Latte Da Royal Constantine was born in 2012. Rosie, like Heidi has had a tremendous impact on our herd's foundation.